This is not sponsored by CreditCards.com at all – I just found their survey super informative! People definitely have some ideas for what they would do in case of a financial emergency, but many of the ideas can be disastrous and do a lot more harm, such as relying on a credit card (if you know you won’t be able to pay it off before interest starts to accrue) as well relying on a payday, auto title, or pawnshop loan. As you can see from the above, there are many options for your emergency fund, and there’s no perfect answer for everyone. For some people, they may really see the positive on having a credit card emergency fund, but for others, it can lead to a very stressful situation. There are many things you should think about before deciding to use a credit card as your emergency fund. Different people need a different emergency fund amount. Some of the things you will want to think about when determining your emergency fund amount is the stability of your job, your income when compared to your expenses, whether or not you own a house and/or car, your health, and more. Basically, the “riskier” your situation, the larger your emergency fund should be. If your situation is quite risky, then using a credit card for your emergency fund may be a bad idea. This is because there is a large chance you may rack up credit card debt that you are unable to pay off whenever an emergency arises. 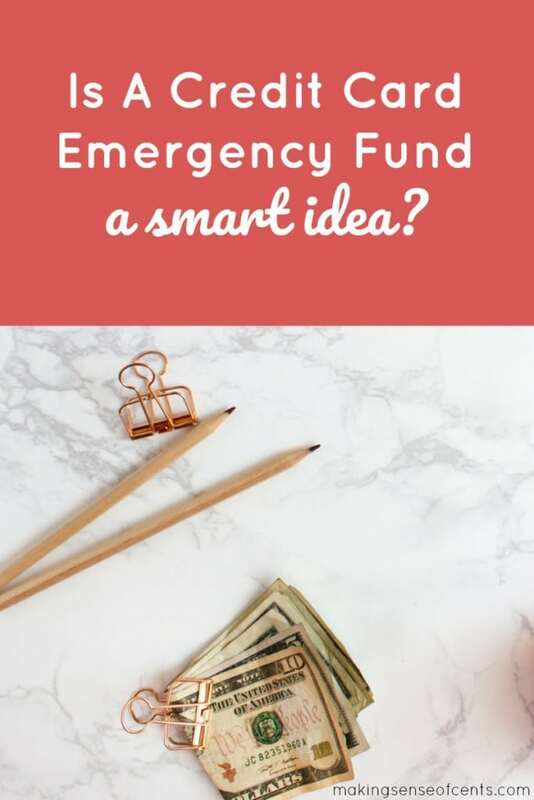 On the other hand, I know a few people who don’t have emergency funds because they save a large percentage of their income each month, and they know that their savings each month could be easily used towards the majority of their financial emergencies. You’re the best gauge for determining what is a good or risky financial situation, but you need to be realistic and realize that what may work for one person may not necessarily mean that it will work for you. Do you mind the risk that comes from credit card emergency funds? By relying entirely on a credit card emergency fund, you are going to be taking on a lot of risk. You never know if something may come up, how big the expense may be, and whether or not you will have a large enough credit limit to fund the expense. Plus, the interest rate on your credit card may hover somewhere near 25%, which can make for an expensive bill if you are unable to pay your credit card balance before interest accrues. When does using a credit card emergency fund make sense? Different techniques work for different people. And, that is why personal finance is personal. There are situations where using a credit card for your emergency savings fund may not be a completely bad idea. If you know that you can pay off a large expense within one month, then using your credit card as an emergency may not be a bad idea, but you still need to be careful before adding any debt. See, the problem with this thinking is what happens if you lose your job? Many have emergency funds that exist so that they can support themselves if they were to lose their job. What would happen if you relied on credit cards but lost your main source of income? Having a “real” emergency fund can be much more worthwhile. An emergency fund can help you if you lose your job. No matter how stable you think your job is, there is always a chance that something could happen where you may need money fast. An emergency fund is wise if you don’t have great health insurance. Deductibles can be quite high these days, and a good emergency fund can help you if a health crisis were to come up. An emergency fund is a good idea if you have a car. You just never know when it will need a repair or if you will get into an accident. An emergency fund is a need if you own a home. One of the lucky things that homeowners often get to deal with is an unexpected home repair, such as from bad weather. An emergency fund can protect you in many other areas as well. This includes medical expenses for your pets, if you have to take time off work for something, if you suddenly need to travel to visit a sick friend or relative, and so on. An emergency fund is always good to have because it can give you peace of mind if anything costly were to happen in your life. Instead of building onto your stress because of whatever has happened, at least you know you can afford to pay your bills and worry about more important things. As you can see, there are plenty of positives of having an emergency savings fund. However, I know that different things work for different people and that some prefer to use credit cards in the case of an emergency. I think the average person should probably have some sort of emergency fund. Even if you can only manage $500 to $1,000 right now, that is better than nothing. $500 to $1,000 may not cover the entire cost of your emergency, but it will at least help you a little bit. Plus, you can still put money towards high-interest rate debt after you build up your specific emergency fund amount. My problem with using credit cards as your sole source for an emergency fund is that, in some situations, it may lead to more debt. Sure, some people can use their credit cards to their advantage, but the average person most likely needs a real emergency fund that they can count on. What do you think of credit card emergency funds? Are they a valid idea for the average household? The post Is A Credit Card Emergency Fund A Smart Idea? appeared first on Making Sense Of Cents.